It was at this meeting that Hassan Rouhani announced in the presence of journalists that Iran had suspended the supply of uranium hexafluoride to gas centrifuges installed at the pilot uranium enrichment facility at Natanz. President Putin was satisfied that the priority right to announce it had been granted to Moscow. The fact of this suspension was confirmed by the IAEA inspectors soon after that. As a result of negotiations in Moscow, Rouhani won the support of Russia on the nuclear dossier issue on the level of the UN Security Council and the IAEA Board of Governors. This fact allowed Tehran to avoid international sanctions that might have been imposed against the IRI by the UN Security Council as early as in 2003-2004. 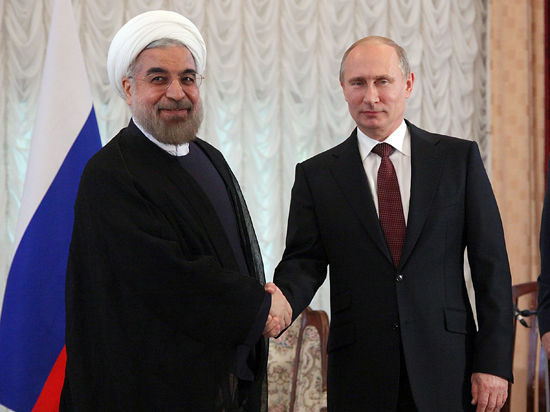 In the meantime, Rouhani managed to establish personal relationship with Vladimir Putin. The second meeting of Hassan Rouhani and President Putin was held in February 2005, when the main concern was the issue on attracting foreign countries to resolve the Iranian nuclear crisis. This meeting was required as negotiations with the EU “Big Three” reached a deadlock. In the latter case, Iran’s nuclear dossier could have been reviewed by the UN Security Council. In the course of this meeting Vladimir Putin promised nothing to Hassan Rouhani, but agreed to act as a mediator between Washington and Tehran to resolve the nuclear crisis. Changing the position of Russia was determined by the fact that the IRI could not prolong the suspension of uranium enrichment at Natanz anymore. Vladimir Putin brought to notice of Iran that in case Iran resumed gas centrifuges operation, its nuclear dossier would probably be submitted to the UN Security Council. And Russia would not be able to prevent it. Above mentioned facts convince us that Russia was engaged in a partnership dialogue on nuclear field with Iran in 2003-2005. It did not seek any additional benefits and tried to help in resolution of the nuclear crisis. Moscow tried to pursue similar policy in future despite strong pressure from the US and other Western states. Hassan Rouhani of all people understands it. The contact between President Putin and Hassan Rouhani that was established earlier cannot be developed in full so far, despite a great number of bilateral meetings. And there are a number of reasons for this. First of all, Hassan Rouhani is a political figure complex for the perception, close both to conservatives and reformers. That is why his policy is difficult to predict, especially given the dependence of Rouhani on the Supreme Leader Ali Khamenei. Secondly, Hassan Rouhani victory in the presidential elections in 2013 could bring back the control over executive power in the country to the Iranian clergy dissatisfied with the rapid growth of political, military and economic power of the Islamic Revolutionary Guards Corps (IRGC) under Mahmoud Ahmadinejad. In 2014, President Hassan Rouhani tried to restrict the IRGC activities in the economy. In response, a smear war against the President’s team which was accused of corruption was launched. As a result, the IRGC won, and in late 2014, Hassan Rouhani was forced to publicly praise the IRGC activities in the economic sphere. Thirdly, Moscow was extremely concerned about the expansion of the US-Iranian contacts on the level of the US Secretary of State John Kerry and the Minister of Foreign Affairs of Iran Mohammad Zarif. Later these concerns intensified when US and IRI started limited military cooperation and interaction of the security services in Iraq. The latter also took place in Afghanistan. Hassan Rouhani determined the main objectives of his administration as economic recovery under growing pressure of sanctions, and normalization of relations with the West. At the same time, they did not include the refusal of the Iranian principles. According to President Rouhani it was necessary to curb the US power that stood in the way of Iran’s economic progress. But this task turned out to be extremely difficult to execute. The progress of the Iranian-Western relations is obviously dependent on successful resolution of the nuclear crisis. However, in reality it did not happen even after April 2, 2015 when IRI representatives and the Six international mediators on the Iranian nuclear crisis resolution (five permanent UN Security Council members and Germany) reached the “interim agreements” on the major principles of the Agreement on the Iranian nuclear programme in Lausanne (Switzerland). These agreements are rather a publicity stunt than an attempt to resolve the nuclear crisis. The reason is that the specified agreement is not based on the principle of “gradualism and reciprocity”, and its implementation will take at least 10 years. Neither will all the unilateral sanctions against Iran be lifted. First of all, it concerns the USA as the Obama Administration may only suspend these sanctions. As a result, Iran will keep its nuclear potential that can be used for nuclear weapon creation in future, while the USA will get an opportunity to control the Iranian nuclear activity with the help of the IAEA inspectors. This means rather fixation of the current level of Iran’s nuclear program than the resolution of the examined crisis. Returning to the consideration of the Russian-Iranian relations, it is necessary to note that on September 13, 2013, Hassan Rouhani participated in the SCO summit held in Bishkek. This was his first foreign visit as the country’s President. On the sidelines of the summit, President Rouhani took part in bilateral meetings with the Russian President Vladimir Putin and the Chairman of PRC Xí Jìnpíng. During these meetings, they exchanged views on the Syrian crisis and Iran’s nuclear issue, which revealed the similarity of their positions. However, no breakthrough in relations occurred, which indicates the complexity of this process with the new Iranian leadership. Moscow still has concerns that Tehran may improve its relations with the West bypassing Russia, which is why the Russian Federation is interested in establishing closer (partnership) relations with Iran. The IRI is still cautious on this issue so far. According to Russian experts, “it is conditioned by two blocks of reasons: economic and political. The first one lies in the fact that the major concern of the acting Iran’s government is improvement of the country’s economic situation that is strongly disrupted by sanctions (in this respect China will be more helpful than Russia)… Secondly, the current leadership of Iran is seeking direct negotiations with the United States.” The telephone conversation of Presidents Obama and Rouhani on September 27, 2013 in New York confirmed it. However, a tendency favourable for the development of Russian-Iranian relations is now observed inside Iran. It is determined by a gradual ebbing of influence of Ali Akbar Hashemi Rafsanjani, the richest person of Iran, the country’s ex-President and a supporter of Iran rapprochement with the West. It was he who greatly contributed to Hassan Rouhanni’s rise to power. Hashemi Rafsanjani desperately hoped to become a new Rahbar (Supreme Leader) of Iran. For this purpose he earlier chaired the Experts Council (this body elects Rahbar). But unexpectedly for many people, the Experts Council was chaired not by Ali Akbar Hashemi Rafsanjani but Ayatollah Mohammad Yazdii, the former head of Iran’s judicial system. The latter is a severe opponent of the West. Iran is now considering the issue on the successor of the Supreme Leader Ali Khamenei, but the current state of his health is not as bad as the media tends to describe. In 10 months, the Experts Council members will be completely re-elected. Supporters of the reformers expect that they will be able to change the situation in their favour. But it is more probably that the conservatives will strengthen their positions. This will promote strengthening of the Russian-Iranian relations. In addition, the next challenge for Hassan Rouhani will be the next year’s elections of the Mejlis (Iran’s parliament). Strengthening of conservative positions there will give evidence that it will be difficult for Hassan Rouhani to remain the President for the second term. A serious limiting factor for development of relations between the Russian Federation and the IRI is an extremely low bilateral commodity turnover (it amounted to less than 1 billion dollars in 2014). This situation can be fundamentally improved by establishment of a joint account or bank for settlements in national currencies, as well as implementation of the major projects in the economic sphere: construction of two power generating units at the Bushehr Nuclear Power Plant, building “the power bridge”, participation of Russian companies in the reconstruction of Iran’s railways, and a significant expansion of cooperation in gas markets and supplies of agricultural products that partially compensate for the losses suffered by Russia from sanctions imposed by the West. Let us examine some of these projects in detail. Implementation of the project of “the power bridge” includes export of 500 MW of Russian electric power to Iran, construction of new power generating facilities in IRI, and almost a complete modernization of the Iranian electricity distribution network. Its cost amounts to $8-10 billion. Owing to the Tehran decision to switch to mutual settlements in the national currencies with Moscow, no serious “appreciation” of the contract for the two countries will happen. Apart from it, the Bushehr NPP was launched at full capacity in summer 2013 under the control of the IAEA. This allowed raising the issue on the construction of another two power generating units with the capacity of about 1.2 (1.5) GW each. This construction implies the transfer of technologies non-critical for nuclear proliferation to the Iranian party. It is regarded as a continuation of the already implemented contract. Currently, Russian experts are carrying out an engineering survey on the sites of the future second and third power generating units of the Iranian Bushehr NPP. Completion of their works is planned for August 2015. This will allow obtaining basic data required for the launch of design. The construction itself can be launched as early as this autumn. In addition to electric power production, the specified units will carry out large-scale seawater desalination. In 8 years, the second power generating unit of the Bushehr NPP is planned to be put into operation, and the third will be commissioned two years later. The corresponding contract on the construction of two new power generating units of the Bushehr NPP was signed in Moscow in late January 2015 as a part of the next round of consultations on cooperation of Russia and Iran in the nuclear energy for peaceful purposes. Another direction which may be developed under bilateral cooperation includes a comprehensive assessment of the safety of the Iranian nuclear facilities by Russian experts. The need for it is determined by the lack of experience of Iranian experts and the corresponding assistance of the IAEA, as well as by the availability of worn-out and obsolete nuclear facilities in Iran. First of all, it concerns the Tehran research reactor, where a long-term operation in the absence of fresh nuclear fuel led to a significant reduction in the reactor power. It made the possibility of testing nuclear fuel produced in Iran for this reactor extremely problematic. The issue of the delivery to Iran of five battalions of air defence system ZRK S-300VM Antey-2500 instead of previously non-delivered five battalions of ZRK S-300PMU-1 is being considered. The corresponding proposal was officially sent to Tehran three months ago. If this proposal does not satisfy IRI, then discussion of delivery of S-400 Triumph will be possible, but to do so it is required to agree not only its cost, but also the term of supply, as the contract on the delivery of 4 battalions of such air defence systems worth $1.9 billion to China was signed in September 2014. And the Russian Federation Armed Forces shall obtain 56 regiments of S-400 by 2020. Thus, the former state of the Russian-Iranian relations which was characterized as “cautious partnership” is a relic of the past. Resolving the common regional problems in Syria, Iraq, Afghanistan, Yemen or Nagorno-Karabakh requires closer bilateral cooperation. The current economic situation that is unfavourable for our countries due to unilateral financial and economic sanctions on the part of the West also presses hard for this cooperation. Its improvement on the bilateral level is quite possible via implementation of the above mentioned projects. At the same time, the danger of changes in the world oil prices and the entry of Iran’s natural gas in European market in case of the lifting of the corresponding unilateral sanctions against IRI should not be exaggerated. Against the backdrop of some improvement in the relations between Iran and the West, in order to establish a real Russian-Iranian partnership it is necessary, first of all, to form a new common agenda for negotiations, abandoning such projects as the exchange of Iranian oil for Russian goods. At the same time, the transition from military-technical to bilateral military cooperation is becoming more urgent. Such an agenda for negotiations is being prepared now. Its approval can take place in the second half of this year, if the first official visit of President Vladimir Putin to Tehran in the history takes place.